Natural gas flaring (NOAA). Often it is less expensive to burn natural gas than it is to get it to market. Since I am in the field installing science onto an airplane, this is going to be a short post. In a prior post, I showed graphs with natural gas prices being de-coupled from oil (recreated and updated with the latest numbers here). I decided it was high time to do some maths related to it. All the data is from the EIA, and all the analysis is my own. I had to interpolate average coal prices for the past two years based on its link to specific coal prices. If you know what correlation is (I think most of you do), skip over the description of correlation and go straight to Maths, since it is very rudimentary, and you could probably make fun of me for writing it. If you want to do better statistics with the data set, let me know and we can have some fun. One important point! These prices are well-head prices. In other words, it is roughly what the major distributors of gas will pay for the stuff. Your prices as and end-consumer won't change. In other words, they pay less when the price goes down, but they sell you to at the same price. That works out pretty well for them, doesn't it? Correlation: correlation is a measure of how closely two data sets match. In other words, correlation answers the question: when one set of data goes up, does the other go up? It is important to remember that correlation does not imply causation. In the case of natural resources, this idea is very easy to understand. The price of oil and natural gas both rose together in the 90s. This does not mean that the price of oil rose on its own, causing the price of natural gas to rise. Natural gas prices rose for pretty much the same reasons as oil prices rose. In this case, demand for things that burn and produce heat caused an increase in price in both of them. Wellhead hydrocarbon prices over the past 3 decades. The price of natural gas used to follow the price of oil. In 2008 this changed thanks to hydrofracking. A classic example of the abuse of correlation and causation is ice cream and murders. Both murder rates and ice cream purchases tend to rise in cities at the same time. One could conclude that ice cream causes murderous rampages, or that the best way to relax after murder is to eat ice cream. Both of these are silly to conclude. More likely, there is an outside factor that causes both. It could be hotter weather makes people eat more ice cream, and simultaneously makes them more irritable. Or it could be that hotter weather makes people eat more ice cream, and it also makes more people be outside, where they are more likely to get murdered than in their homes. The point is that correlation can show that two factors are tied together, but often requires more than that to show a direct causal link. Hokay. Correlation goes from -1 to 1. 0 means no correlation, 1 means perfect positive correlation: one thing rises, the other one rises by a predictable amount. -1 means perfect negative correlation: one thing rises and the other falls by a predictable amount. The overall correlation between oil and natural gas prices from 1986 to 2012 is .68. This is pretty good for noisy data sets (noisy meaning there are outside factors, like commodity speculation in the markets). The correlation between natural gas and coal over that period is .4. This is pretty low, and partially represents inflationary increases in prices of both of these over time (if I had used real 2005 dollars instead of nominal dollars, all of these correlations might decrease). More important is breaking out the correlations between early and late. I mentioned in the prior price post that decoupling began to happen in 2007, and then accelerated. The 22 year correlation between gas and oil until end of 2008 was .88, very high, much higher than .68. After this, the gas:oil correlation becomes -.23. The prices have become decoupled. At the same time, the correlation between gas and coal rises to .69. Not great, but definitely more coupled than gas and oil currently are. One thing is clear about natural gas prices and correlation. Natural gas prices in the US used to be tightly coupled to oil prices. Natural gas prices in the US are no longer coupled to oil prices. They are instead coupled to coal prices, though not as tightly as the prices used to be coupled to oil prices. Hydrocarbon prices per million BTU after hydrofracking. Pretty easy to see that decoupling, eh? Now we discuss the cause. The cause in this case is definitely hydrofracking in the US. Outside the US, oil and gas prices are still more correlated. Okay, that was a short discussion. Some caveats: the numbers I used for historic coal prices are mean annual coal spot prices weighted for what was bought. These are correlated to monthly oil and gas prices. These coal prices were not available for the last two years. They are, however, tightly coupled to coal prices in general. I looked at similar priced coal over the two years, and extrapolated the prices for my model based on these. Given the very tight link of mean coal prices to the price of specific types of coal, this is not a faulty method. If someone were to use a more consistent methodology to determine coal prices throughout the entire time period I have sampled, it would produce results that are nearly identical. Oil prices and natural gas prices were historically tied. With the advent of fracking in the US, natural gas prices decoupled from oil prices, and have coupled with coal prices. So much for a short post, eh? This is one of my favorite topics! Hydrofracking (short for hydraulic fracturing) is used to extract both natural gas (Barnett and Marcellus Shales) and oil (Bakken Shale, a few other places) from regions that used to be too dense to extract hydrocarbons from, or that would otherwise not produce much. These dense rocks, called “tight formations” (formations meaning rock beds, tight meaning not having connected holes) are not permeable enough for hydrocarbons to move out of them at high flow rates. (Permeability means fluids can flow through something. Paper towel is permeable, plastic is not.) Believe it or not, many types of rocks are very permeable. They have lots of interconnected cracks. Shale is not such a rock. It may have space inside it with oil or gas, but these spaces are not connected by the cracks that would allow these hydrocarbons to flow out to a well. A well drilled vertically into this shale would produce almost nothing. These hydrocarbons stayed in the ground. Hydrofracking changed that. Hydrofracking, in short, is exploding cracks and holes in the ground with shaped charges and water and then pounding sand into those holes. Hydrofracking requires 2 to 3 million gallons of water and 2 to 3 million pounds of sand per well. Hydraulic Fracturing first requires drilling a hole in the ground. These holes can be kilometers deep. The advent of horizontal drilling allows for drilling horizontally by bending the steel tubes of the well. Sounds crazy that steel can bend? Given 300 feet of pipe, the steel pipes can bend at a right angle. Horizontal drilling can cost up to 4x what normal drilling costs, so it is only used in places where it can greatly increase production. Like hydrofracking applications, where it makes a well go from zero production to up to 2000 barrels of oil per day. This is where the magic happens. Formations that hold oil and natural gas are often horizontal. First a vertical well is drilled, then it goes horizontal for up to 10km. For hydraulic fracturing, shaped charges are planted inside the pipe in the horizontal section. They are then directionally exploded into the rock, creating large cracks in the rock extending away from the pipeline. Next they pressurize a viscous fluid and cram it into the drilled hole using dozens of pumps to create massive pressure. This process can take dozens of trucks work of fluid, pipelines, and pumps. The trucks gang-pump fluid into the hole. The fluid finds the cracks in the pipe and rock made by the shaped charges. The fluid rips through the rock, rending the cracks, expanding them in length and volume and connecting them. These cracks become very widespread. The former tight shale or sandstone formation that prevented the flow of fluids is now a series of connected cracks leading to the pipeline. Fluids can flow. Dozens of hydrofracking trucks pump hydrofracking fluid into the hole. Source. When the hydrofracking fluid is drained, the cracks can close up again. To prevent this, something called a proppant is used. A proppant props open the cracks, much like leaving a door stopper in your door. Typically sand was used for this, but new proppants with special shapes and properties are being used as well, like ceramic beads covered in resin for deeper wells. The proppant is put in at the same time as the hydrofracking fluid. When the trucks reverse the flow of hydrofracking fluid and pump it back out, the proppant remains behind. Proppants hold open the rock and allow flow, but this is not permanent. Flow reduces over time. The first year after hydrofracking happens is the most productive. Drilling and hydrofracking a hole, then closing it, reduces the hydrocarbons you will get out of the hole compared to drilling and pumping. If you frack a hole and then close it, the hole will ultimately produce a lot less hydrocarbons than if you drill and pump. In other words, once you have fracked, you gotta make use of that hole or you will lose a lot of money. Natural gas hydrofracking in the US is one of the more polarizing topics. The chemicals in fracking fluid are of such low concentration that it does not matter if it gets in the local water supplies. But they mix concentrated versions of these incredibly toxic chemicals into the fracking fluid. In other words, the fracking fluid may not be toxic, but the pure chemicals they keep on-site to mix into these trucks sure are. If any of this leaks into the environment (it has), it can be quite damaging. One can hope that this sort of thing is both rare, and well-controlled in the future. There is the leaking associated with hydrofracking for natural gas. Howarth (2012) estimated there is an upper limit of 8% of methane leaking from natural gas extraction and transport for hydrofracking. Given the factor of 23 greenhouse warming potential of methane, this is a problem. Compounding the problem is that mineral and resource policy are states rights in the US. NY and PA do not have the law history in place or the resources to figure out how to deal with the potential pollution from fracking, nor the resources to enforce the policy. This, in part, is why fracking has been stalled in the Marcellus in many places. The Bakken formation. Here the sandstone contains the oil. It is sandwiched between two impermeable layers of shale. There are other important implications for fracking specific to oil production. In order to drill, a company has to lease drilling rights. When a company leases drilling rights, they have obligations to produce certain amounts of hydrocarbons within a short time-frame, or they lose the lease. So they drill. A lot. Remember how we talked about holes losing productivity over time? Once a fracked hole is open, they are unlikely to close it. The problem? In the Bakken shale, they co-produce natural gas with oil. There is no infrastructure to pipe the natural gas away. They burn it instead. Some of it may leak. In other words, they are producing massive amounts of pollutants and GHGs. North Dakota does not have the ability to quickly build infrastructure to capture and transport this natural gas. And North Dakota doesn’t quite have a population that is accustomed to or capable of having a lot of bureaucracy to deal with these issues and enforcing policy. It’ll be a while before this is handled. In the meantime, North Dakota will light up the night sky like a mega-metropolis. 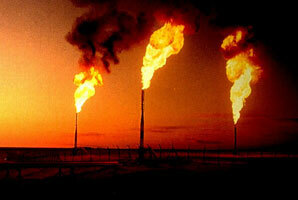 The flaring of natural gas 24/7 in Bakken makes North Dakota look like it has one of the largest cities in the US. If you look at the picture below, you can see a stark contrast. You may have heard that Hydrofracturing for natural gas is a phenomenon that is not repeatable outside the US. This is untrue. It likely cannot be repeated in Europe, but China is just discovering shale gas deposits that could rival or outsize that of the US. There are also likely large deposits in Africa. As far as shale oil goes (not to be confused with oil shale! ), it is also likely available outside the US. We are just really good at getting stuff out of the ground here. You may have also heard that this could make the US energy independent by 2035. If we don't grow our appetite for oil, this could possibly happen. It is unlikely, but that is a topic for later. The US is already one of the largest producers of oil on the planet. Is this a good thing? It is a mixed bag. It will definitely be a boon to the economy if we are not sending nearly $1 billion a day overseas to satiate our demand for oil (we use 18 million barrels a day in the US, importing 10 million of those @ $100/barrel, or a billion dollars a day). It would not prevent the middle east from getting a ton of money from oil still, as Asia and Europe will still buy all the middle east oil. It likely won't decrease the price of gas in the US, since any increase we make in production will be matched or outstripped by increased demand in China (1.3 billion people), then India (1.2 billion people), then Africa (2 billion people) in the 2nd half of the century. In other words, it won't change much on a world scale. Producing this much oil domestically also will keep the US addicted to oil, rather than transitioning to cleaner energy sources and more rational lifestyles that don't burn tons of resources. But the whole quarter of a trillion dollars per year that we aren't sending overseas, if handled properly, could easily boost our economy and help subsidize our way out of oil addiction. It's clearly a thorny topic, and beyond the scope of this post. Fracking will change the energy landscape in the US by providing a lot more natural gas and oil domestically. It has downsides, from increased flaring of natural gas to domestic pollution, but it does have upsides that can be harnessed for the good of our future.